Your Job Seekers Guide is a step-by-step process. It will help you to take charge of your career. You can use this web site. Or you can print out the JVS Detroit Job Seekers Guide (pdf). How will this step-by-step process help me? Your work and life satisfaction starts with your ability to Manage Your Career. Go there to see some of the benefits of managing your career. After you build a foundation, follow these five steps in order. 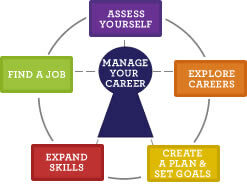 Assess Yourself Find out how your work skills, interests, and values match job options. There are several assessment tools. These tools will help you learn about yourself and the careers that fit you. Explore Careers Learn more about careers that fit you. Here you’ll find online tools to explore types of work and industries. You should know which careers match your goals before you apply for jobs. Set Goals Goals are things you want to accomplish or change in your life. It takes effort and organization to make these changes. This section will help you make a career plan to accomplish your goals and find help. Expand Skills You need skills to be qualified for jobs. There are many ways to expand your skills, including education and training. This section has online tools to find your local education options. Also, you'll get tips to find the right education or other skill building options. .
Find a Job Understand the strategies you need to find the right job. You’ll learn about resumes, interviews, cover letters, networking and more. And, you’ll be able to organize your job search to be successful. How do I use this Job Seekers Guide? If you are new to career planning, follow the steps in order the first time. If you need to, you can later revisit the steps in any order. Each page within these steps shows which page is “next.” Look to the bottom of each page and follow the “next” page to help you do the steps in order. The bottom of each page also shows the “previous” page in case you need to review a page that you have already looked at. You can also find a list of all of the pages with a step in menu on the top left side of every page. Most people change careers many times in their lives. Your interests may change. You may move up to more responsibilities. Or, your job may change or end. Having goals will help you decide what to do next. Make career and personal goals today. Look over and update your goals every few years. Also review your goals when big changes happen in your life. When you need to, revisit the career management steps in any order. You can work on more than one step at the same time.